Hi Steph, thanks for your help. I couldn't find any manufacturer specs saying if it is SMPS or not. I think it is because though it plugs into the wall and does not use USB, it is labelled a "travel" charger and is very light and small, only about 3x6x3cm. This is from an 2007 Samsung brick phone if that informs anything. Well, than go for the 10 Ohm resistor. It might be ok. If you got a multimeter you can check out the current flow, it does not exceed 100mA for the circuit. Okay, that is what I'll try. Thanks! Been away for awhile, but back to the work bench. I've got the circuit all worked out - using a 4-AA battery pack with a switch, which I will attach to the back of a baseball cap. Self-contained instead of wearing wires. I'd rather use the 3-point horizontal method than the vertical design. What I'm wondering is if there is a formula for the distances between the LEDs. If I just place the 2 LEDs on the bill at the opposite edges, and then place the top LED at the top of the cap, should that work fine? I've seen dimensions for the vertical mount, so I'm not sure whether the same holds true for the cap method. Also, I managed to get my hands on a TrackIR camera, so I'm also wondering if any of these home-brew jobs will work fine with the NaturalPoint camera. I've also got a Microsoft Webncam to fall back on, just in case. Ok, so I went off the build guides found here. Used the SFH485P IR EMITTER. 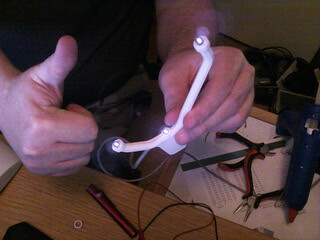 And the resistors specified by the LED assembly wizard. Wired everything up. Hooked up 3V power supply and nothing. Using cell phone to see the ir led and they are not emitting. I tested in reverse by holding remote control against LED and checked voltage with multi-meter and I am getting voltage. Any ideas what my be going wrong? I even tried hooking up extra LED directly to 3V and still nothing. Only thing I can think is that they sent me wrong LED. you can check this with a remote control.If your camera can see the remote it also must be able to see your SFH485P. You can connect one SFH485p led to one 1,5 battery to check if it works.But as you probably know it is a diode and is polarity sensitve. If you still can't find out what is wrong could you please post a picture of your model, values of resistors and if is not visible in the picture if you made a paralel or serial connection. I had a chance to try one of the left over led with a 1.5v battery and nothing. I can see my remote control ir led with my cell phone but not the led's I ordered. Got a feeling its the led that are the problem. Newbie here. I want to give freetrack a try with a 3 point cap using the serial configuration for PC USB. I can get the infra red LEDs & resistors no problem but the PTC fuse I'm struggling with. It has to be PC as I can't spare another wall socket. The best I can find is 100mA hold - 200mA trip. Would that be sufficient? And if so what resistor should I go with? I can assemble the components on a breadboard and use a multimeter for testing if needs be. I would advice you not to connect your model to your rig.The reason is simple, don't gamble with something worth a lot of money.Even with that ptc.I should use a usb-hub with own powersource or a smartphone backup battery with usb-output.I used this also.Perfect wireless sollution and you can play for ages if you take one with 2000mA capacity or more. If you connect it to your pc and you make some shortcircuit by accident and the ptc is to slow.Maybe the chance is 1 out of a million that it will go wrong but if it happens you won't be happy. Okay well I have a couple of USB power banks so that's definitely an option. Should I ignore the PTC and just go with the 10 ohm resistor then? yeah you do not need the PTC. Just go on with the 10Ohm resistor if you use an usb charger. I have made several trackers with the USB schematic without the PTC fuse, because I couldn't find the correct one anywhere cheap. It's working perfectly. Because the resistor is already there you can't really blow up a thing in my opinion. I'm using my computer as a source, for over a year now. Awesome thanks for the replies! Edited by khampf on 19/02/2016 at 00h28. New user to this forum. I appreciate all the good posts. I am going to build a head tracking rig. I plan to use a usb battery bank. Something like a 2200 Mah. Should I be concerned about the output amps. Some are fast charge and at higher amps. What output amps would be good? Thanks everyone for your help.